"This handsome, youthful black and reddish tan, beautifully pigmented dog presents himself flawlessly without a hair out of place. He is alert and solid, standing as an exemplar of the Standard. His proportions are near ideal. He moves perfectly coming and going, and harmoniously from the side with good reach and drive. 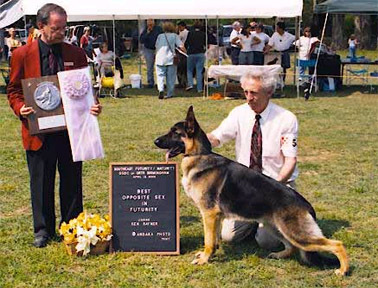 He presents a picture of strength, fluidity, and balance -- a Standard bearer for our breed. The breed needs more of these."